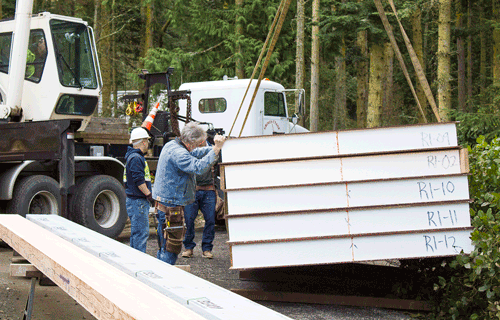 Angeles Millwork & Lumber Co. and Hartnagel Building Supply are proud to be the preferred provider of Premier Building Systems SIPS Panels on the Olympic Peninsula. 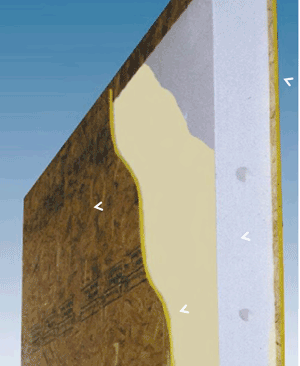 The anatomy of a Premier SIP (Structural Insulated Panel) is a composite of three materials. OSB, InsulFoam EPS and a Laminating Adhesive. Talk to your Contractor Sales Professional about the ability to add SIPS to your next build! Ready to go beyond the basics? Understand the difference between SIPs and Stick Frame construction, or visit Premier SIPS detailed learning center for a 5-step process to get completely up to speed on SIPs in commercial and residential construction. You may also find these links to be helpful in learning more about Premier SIPS Panels. Deconstruction shows how Premier Building Systems (PBS) creates their SIPs and compares conventional lumber applications to SIPS Panels.